As a young kid, you’ll believe anything your parents tell you. Why wouldn’t you? They’re so much older than you so surely they know what they’re talking about, right? Except obviously parents need to stay sane so will sometimes (okay, a lot of the time), tell little white lies to make their job a teensy bit easier. My personal favourites are: Santa will know if you’re being naughty; if you keep pulling that face it’ll stay that way, and the good ol’ eating carrots will give you night vision. Genius. What I can’t necessarily get on board with is parents who get their child’s hopes up and then crush them almost instantly for an April Fool’s prank. That’s just cruel (if slightly funny). 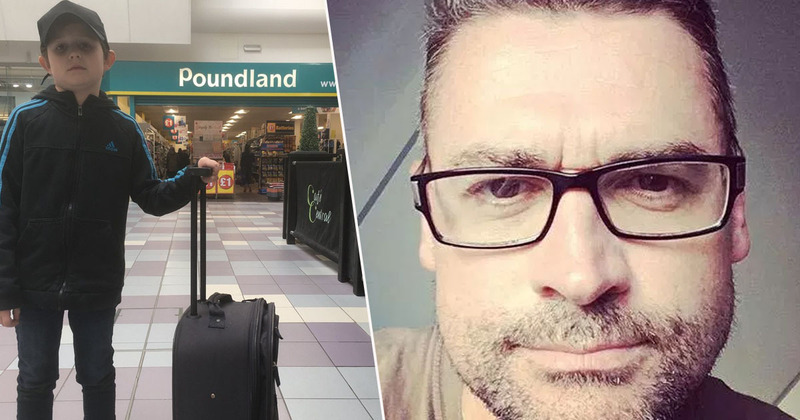 One dad thought differently though, because he decided to trick his son into thinking they were going to Disneyland – only for them to end up at Poundland instead. Joe Heenan, a stand-up comedian from Glasgow, convinced his son they were going on the holiday of a lifetime yesterday morning (April 1), even getting him to bring a suitcase for the trip. I told him we were going on holiday to a place ending with land. Telling his young son they were going somewhere ending in ‘land’, his immediate reaction was obviously the magical resort where dreams come true. However, his dreams were swiftly crushed when they arrived at the bargain £1 store. Taking to Twitter, the prankster dad shared a picture of his son’s devastated face – suitcase in tow – once he realised they weren’t actually going on holiday. The comedian’s tweet quickly went viral, with many commending him for his ‘genius’ prank. However, others had a slightly different reaction and called the stunt ‘cruel’. While one person said Joe needs to take his son to Disneyland for real this time, another tagged the resort in their tweet and asked them to send some free tickets. One person said the dad should buy him whatever he wants to make up for the prank, while another said he should be allowed to fill his suitcase with sweets. Which, y’know, is fair enough. Well since they are there, a £1 bag of sweeties.. go on youngun fill ya boots, or should I say case! LOL.. In fairness, the kid’s probably used to this by now – what with his dad being a comedian and everything. Hopefully he was reimbursed with loads of £1 sweets to make up for his disappointment.